I have a confession to make. I like to promote peace in the kitchen, but the truth is, we have a bit of a battle brewing here at our house. My guy has come to hate pumpkin. And I have single-handedly created that pumpkin-hating monster, because I love the stuff. For every pumpkin recipe I post, I’ve probably attempted another five that don’t make it to the blog. Come fall, I try it in practically everything. It’s the perfect storm of my loving the season, craving all that is pumpkin and pumpkin spice, and being a crazy food blogger. Don’t get me wrong – he’ll eat it. 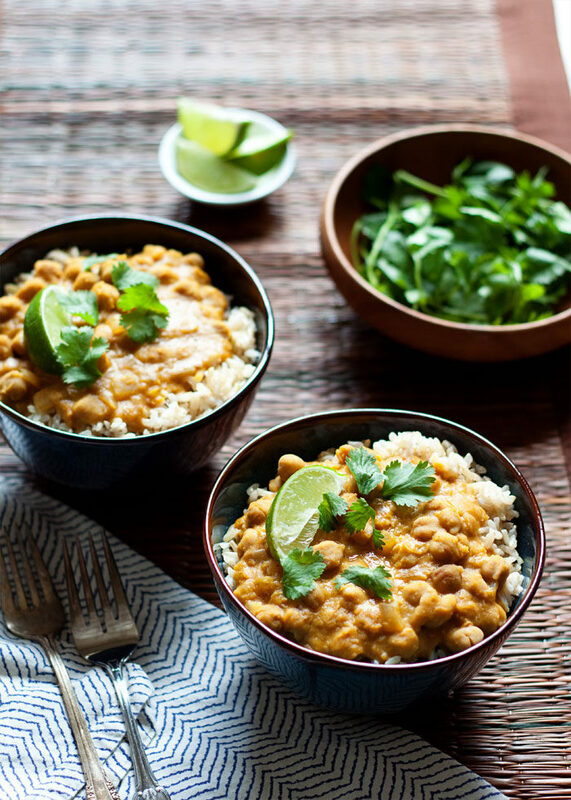 He actually really likes this Slow Cooker Pumpkin, Chickpea, & Red Lentil Curry (probably because you can’t really overtly taste the pumpkin). But it’s funny – I’ll put a bowl of chili in front of him and he’ll ask with trepidation, “is there pumpkin in it?” And when I say yes, he tries to mask his disappointment … and then he digs in anyway. He’s a trouper. But one of these days it might just get ugly. It’s brewing. I can feel it. This is how wars start, right? No? Not really? Well, good. But I suppose I should chill on the pumpkin for the sake of the family. Meanwhile, ALL THE PUMPKIN STUFF! Like this curry, my fellow pumpkin-loving sisters and brothers. 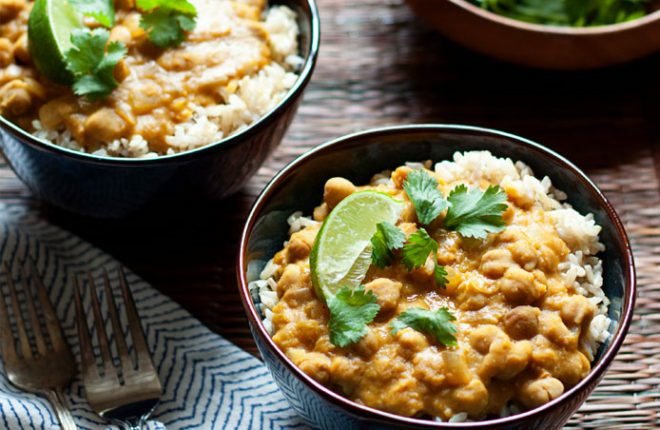 This curry is the pumpkin bomb. Creamy, cozy, easy, and utterly delicious-y. It came about one morning not long ago when I was prepping for this Slow Cooker Pumpkin Red Lentil Chili. The lentils were in, the pumpkin puree was in, the onion was in … and then I realized I really wasn’t feeling chili. 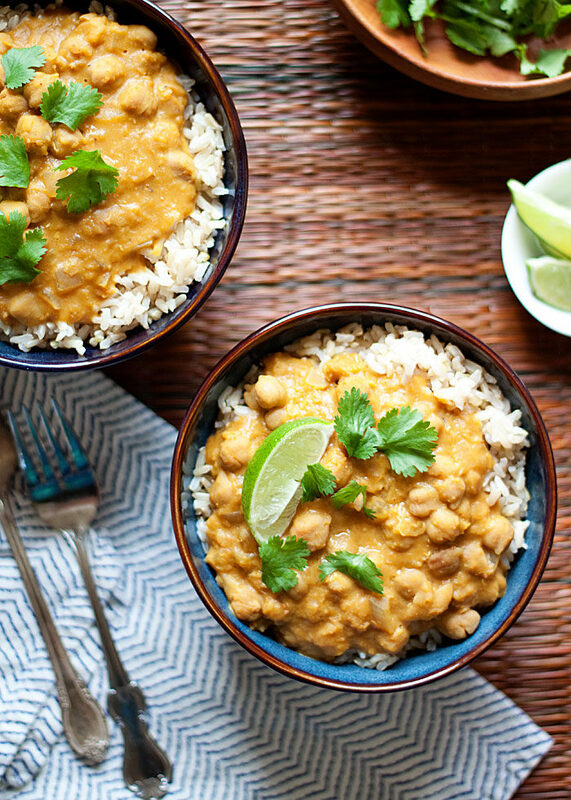 What I was really craving was something akin to this chickpea curry, a recipe a friend had recently tried and enthusiastically described and I couldn’t get it out of my head. And so I decided to go that direction instead. 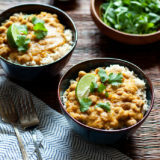 The result was incredible, and with a couple of minor tweaks to the original experiment, this creamy, satiating curry recipe was created. Another confession, while I’m at it: I’m pretty clueless about Indian food. I’ve been to Indian restaurants a handful of times (oh my gosh deliciousness), but not nearly enough. I am getting more and more into making this cuisine at home, so I’m learning. But I wasn’t entirely sure what to call this. It has lentils in it, so is it technically a dal? I’m thinking no because it has chickpeas in it, but if I’m completely off with the naming of this recipe, I have to beg forgiveness. I’m working on it! So how does it taste? DELICIOUS! Seriously, this stuff is so easy, yet so good. Throw it all in the Crock Pot in the morning, and with a pot of rice added to the mix, you’re good to go in the evening. 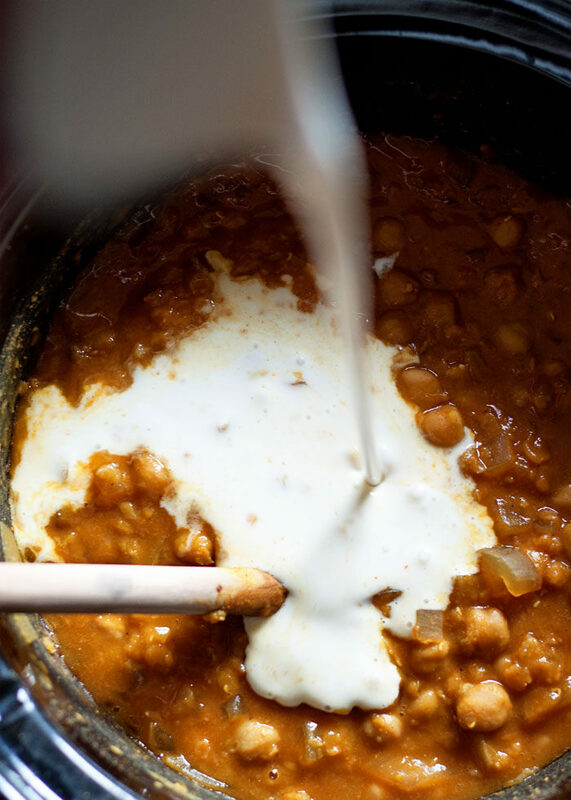 Add all ingredients except the coconut milk to a 3-quart or larger slow cooker. Cook on low 8-10 hours or in high 5-6 hours. Stir in the coconut milk and cook on low for another 30 minutes. The curry will be a bit thin at first; it thickens up as it sits. Scoop over rice and serve with cilantro and fresh lime wedges to squeeze over the top. * Curry powder brands can vary greatly, but I’ve tried several in this recipe and it always turns out great. So just use your favorite brand/blend and you should be good to go. Just printed this recipe to make some night this week! Love the idea, girl. It sounds soooo delicious! Thanks for the recipe! Should the lentils be dry or already cooked? Hi Sarah, thanks for asking this. The lentils should be dry and I’ve updated the recipe to clarify. Thanks again! Oh my gosh, that photo with the coconut milk being poured… I want to dive in headfirst. This sounds unbelievably yummy! Your post made me laugh so much! My guy hates pumpkin too, and butternut squash, and basically anything “fall” flavored. I’ve almost given up cooking pumpkin in an obvious format because he doesn’t want to eat it. But if I disguise it in this curry, I might just get away with it! I just made this and it was AMAZING! Can I freeze the leftovers? I’m so glad you liked it, Melissa! I have not tried freezing it – I’m a little wary because of the coconut milk. I will give it a try next time I make it and I’ll report back! I tried this today. It was really so good, I couldn’t stop eating it. I followed the recipe exactly, and I wouldn’t change one thing. Hearty and full of flavor, this will become a staple in my house. Made this for dinner tonight. Cook time was a little too long on high. Cut back an hour. I think without the chick peas would taste better. Over all pretty good. Thanks for your comments! Crock Pots can definitely vary, which can be frustrating for us recipe writers! Karen, this was incredible! I tweaked the recipe slightly by adding 1 cup of water (it seemed a little dry to be left for 8 hours), and I also added in 2 tsp freshly grated ginger, 2 sweet potatoes, and 2 tsp turmeric. The lime and cilantro put it over the top. I love how they taste with it. Great post! I laughed out loud. Featuring this in a recipe round-up on my blog soon. I’ll make sure to backlink to you. Cheers! This has well-balanced flavours and tastes great. A big win for Meatless Monday. Looking forward to leftovers! do you think I could add 2 or 3 chicken breasts to cook along with the other ingredients? Hi, I’ve not tried it, but I’m sure it would work just fine! Crock Pots are magical that way. 🙂 Maybe just be sure to immerse the chicken pieces so they don’t dry out too much. Delicious and perfect – easy and tastes so good! Thank you for sharing! Can I use dried chick peas in the recipe? I don’t have any canned and I’m trying to stick to a budget! This was so good, thank you! I added a cubed Russett potato and 2 chopped carrots. I think it was because of those additions that I needed to add some extra broth/water and added some curry paste but it was fantastic and lasted for a week!! I am also curious about freezing it because it made so much for just my boyfriend and I – if anyone does this, please share the result! Do you think it’s possible to cook this yummy recipe without a crockpot? Yes. See my review below. Just add more broth. Delicious! 5 stars — Made this last night and loved it! Didn’t have time for the crock pot and it worked well on the stove top. I did end up adding more broth to sufficiently cook the lentils. I always use curry paste, not powder, because it has a much more complex flavor. Served over Jasmine rice with a lime wedge. Yummy and satisfying! Thanks for the recipe! This was really good! I made it tonight and the whole family loved it (all 5 of us). We never eat Indian food (we always get drawn to Vietnamese) so this was a super introduction to the cuisine. My 18 year old is vegan…the rest of us are carnivores….but I could see us being convinced if it can be this delicious. Made this recipe and it tasted great. Just wondering what I could substitute instead of the pumpkin? This is a fantastic recipe. It’s difficult to find vegan crock pot recipes, let alone one where you can just dump in all of the ingredients and walk away. For both of those reasons this was worth a try, but the result was even better than expected. The whole family loved it and I was surprised with the complexity of the flavors considering how few and how simple the ingredients are. It won’t win any beauty contests, but it sure is delicious. This is a keeper. I just made this for the first time today and daaaang it turned out good. So creamy and filling and rich! I’m serving it over roasted cauliflower. I’m sure it would have been absolutely perfect if I had followed the recipe exactly, but I added extra cayenne and threw in the rest of the can of pumpkin (just so I didn’t have to store it). Adding this to the rotation for sure. Thanks for sharing! Yay! Glad you like it! Love the idea of serving it over roasted cauliflower; I am going to borrow that idea! Would it be possible to use canned organic pumpkin? Fantastic recipe! 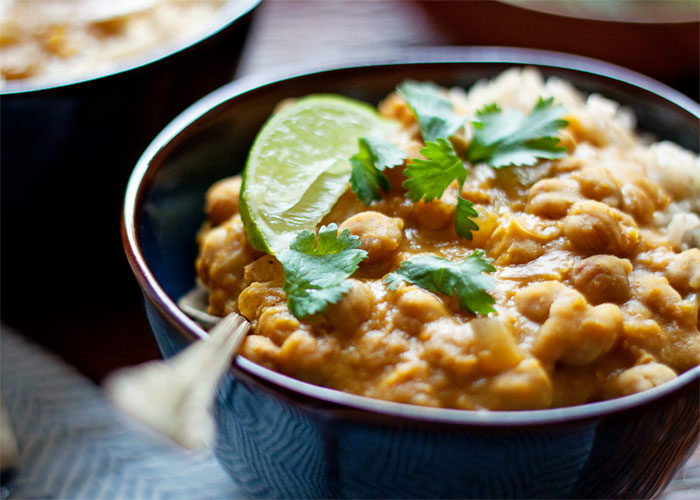 I use have used Chackalaka spice from South Africa instead of the Curry and it also yummy. Was wondering if you have the nutritional facts for this recipe? 😀 Love it; so glad you like it! I haven’t made it yet this year and this comment reminded me I need to do so stat. 🙂 Thank you! do you happen to have the nutritional facts on this meal? thanks! Did not expect to love this as much as I did!! I made it in my instant pot on the “slow cook” setting. Only took one hour, added the coconut milk, waited maybe 5 or 10 min while I heated my rice, and it was absolutely perfect. I’m glad you were pleasantly surprised! I SO need an Instant Pot. I just made this and it is delicious. I used almond milk because my husband does not like coconut milk. It is a delicious, delicious meal. I started making this recipe tonight and accidently put in the coconut milk at the beginning instead of the last 30 minutes. Is there anyway I can save it? It should be just fine. Might get a little burnt/weird around the edges but otherwise it should be good! is it possible to cook the rice in the crock pot alongside the curry? Hmm … probably not in the same Crock Pot (that would make it so easy if you could!) The rice would throw off the moisture level. Maybe in its own Crock Pot, but I’ve never had much luck with rice alone in the Crock Pot! I was “searching” for red lentil recipes and found yours. Made a copy and I will be making it as soon as I get the coconut milk. We are giving our Halloween pumpkins a second life by using them for this dish! I’ve just put them in the oven, per your pumpkin puree instructions, and will be making this stew after that! I only have 1 can of garbanzo beans, so it’ll have to be aduki beans as well. Looking forward to it! Can I use cow’s milk or water in replace of the coconut milk? This is amazing!! My family enjoyed it 😉 It will clear out your sinuses, lol! This recipe was so easy and my meat-loving husband is obsessed! Any time I can get my husband to eat something this easy, healthy, and vegetarian is a win. I couldn’t find red lentils so I used regular lentils and they turned out just great. I also used dried garbanzos I had soaked overnight. The only thing I will mention is that I had to add the coconut milk a little earlier. After about 5-6 hours on low, the recipe was starting to get “burned” from lack of liquid. The extra cook time for the coconut milk didn’t hurt it. Anyway, I plan on making this again and perhaps adding some carrots or peas at the end! Yum! Thanks for a great new meal for the slow cooker! Made this yesterday! Added twice the red curry powder and baked a pumpkin and a Kabocha squash and added the pulp from half of each because I didn’t have time to puree it. But they were soft enough to do so. Family LOVED this. But guess what, I forgot to add the coconut milk to it and it was still delicious! There’s tons of leftovers today, so I will try it today for lunch. So good highly recommend yummy!!! This is the 1st recipe that I try from this website and it was terrific! My husband & I both thoroughly enjoyed it! I have a ton of pumpkin puree in my pantry that I’ve been looking to use up! This recipe looks SO good! I may alter it a bit and include it on my food blog, if that’s OK with you? Looking forward to tasting this recipe! Any chance you’ve tried this with Thai red curry paste? I was thinking this was a Thai recipe when I bought the ingredients, but turns out it’s Indian. I’m so glad you liked it! 🙂 Thanks so much for the review. I feel like it needs a little something — more salt? Peas? Diced tomatoes? But considering how easy this is, I’m not complaining. Dumped everything in the slow cooker and walked away and dinner is served. If I figure out how to tweak it I will add another comment. Maybe I need more expensive curry powder? Turmeric? Cumin? Spinach? I made this for dinner tonight. It couldn’t have been easier! My only change was to add a cup of frozen peas and a bag of baby spinach when it was done cooking. I served it over brown rice after I let it sit for half an hour. It was rich and creamy. Thank you for a delicious and satisfying recipe that I’ll be making regularly! Love the idea of adding some green! So glad you liked it. Great recipe! It is truly easy and delicious, not one of those “easy” recipes that take 2 hours to prepare. Mine only required 4 hours cooking (on high). It was done and starting to burn on the edges by 4.5 hours. I will be making this again…and again. Haha this is an absolute favorite of ours too! Recently I’ve been making a version without pumpkin, adding potatoes and some frozen peas at the end. I eat it for breakfast, lunch, and dinner, ha. I need to get that recipe out there too! I want to make this for a potluck the night before. What is the best way to reward it? Overn, microwave or back in slow cooker? Hi Elizabeth, personally I would just stick it back in the Crock Pot on high, then once it’s hot, I’d switch it to WARM. So easy for a potluck!